Order your Marlen Aderl Fountain Pen today from FahrneysPens.com. Fine Pens, Refills & Luxurious Gifts – great prices & fast shipping. Marlen dedicates this numbered edition Aderl Fountain Pen, to the origins of the Atellan territory, where the company has been founded. Aderl was the first coin minted in the ancient city of Atella and represented the independence of this territory in its ancient origins. 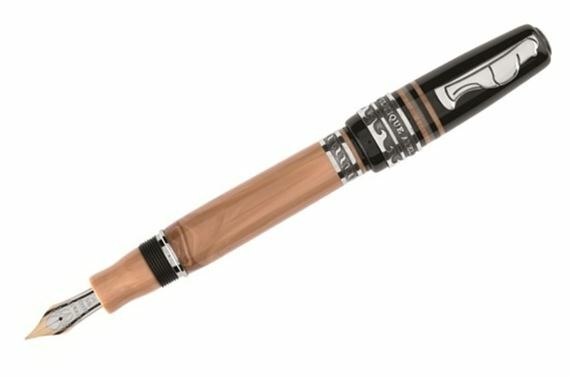 The barrel of the pen is light brown Italian resin, with silver and metal details. The black resin cap has multicolored bands as well as a silver band. The clip depicts Maccus, one of the most important figures of the fabulae the Atella. Also available in a roller ball. Cartridge/converter fill.